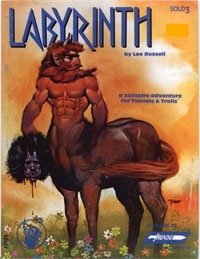 Labyrinth is a solo designed to challenge one first or second level warrior at a time. Beware - finding a path out of The Labyrinth will not be easy. Enter if you dare. This is a Solitare Adventure for use with the Tunnels & Trolls game system. You will need the Tunnels & Trolls rules to play.